“When I think about Mike and Northfield, I am drawn back to the early ’70’s when he first attended and found the experience formidable, and then forward to the 90’s, when the Conference had long become a cherished event in his life. Mike participated in 34 conferences in a row (remember when he played the “ancient relic” in the Talent Show?) and having two of our children and four of our grandchildren become faithful Northfielders was very special to us both. In his consistently quiet way, he was a loyal, contributing member of the community, and often a legal resource during our Community and Annual Meetings. 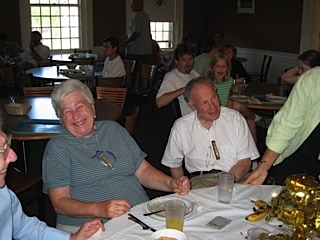 For me, it was particularly valuable to have someone to share the week, both during and after the conference was over.” Mike left us in 2006 and we continue to miss his quiet and steady presence. I loved seeing Mike take his morning walk at the old campus. It was so surreal and peaceful watching him glide through the mist. Great man, very missed.